Fen Favs in Google Slides & more Google Tools! 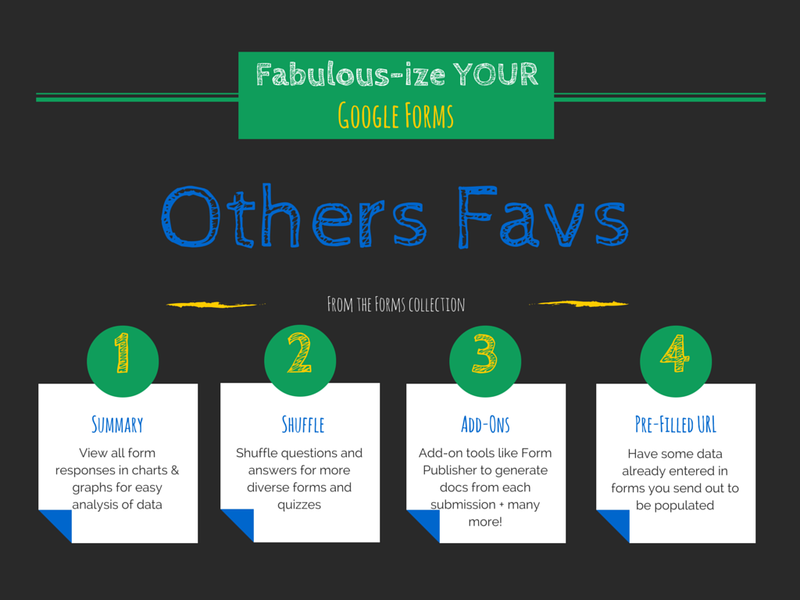 I've seen and made a ton of how-tos for Google. 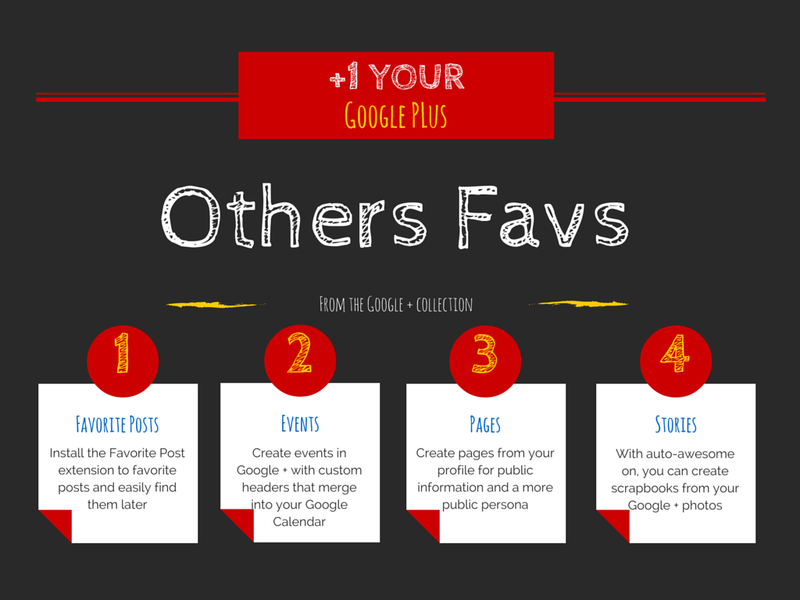 However, I often find myself asking - what are others' favs? What are the selling points for Google? So, with that in mind, I'm starting a series of short Google Slides with my favs and the favs of my teachers. Feel free to comment with your favs. I would love a collection of ideas that are easy to find and easily searchable. Because, unfortunately, it's also easy to get lost and overwhelmed in ideas. So, let's start with Slides - here are my favs and my staff's favs. What are yours? Here are some of my other favs - What are yours? Let's see if we can make an easy-to-access resource for others to find new ideas that are easy to implement and easy to revolutionize! Check out Fennovation.org for more Google-icious information. Respond to this post with your favorite ideas for Google Slides & Sheets! Hour of Code - why do it? There is a lot of buzz surrounding coding in schools right now. If you mention coding, I'm sure you will generate a lot of attention. However, before moving down the path, I think it's crucial to ask yourself "why?" Why is coding important? Why does everyone want to code? Is coding just the new buzzword? Well, yes - it is. But, it can be more than a buzzword. It's important to know why you're jumping on the coding train. Because of it's new popularity and support from several high profile names, it can become something people just do. For instance, I have encountered several educators this year who are now pushing the Hour of Code and code in the classroom because of its fame but not because they know or understand the need. And, as a result, we have classrooms where coding is separate, where coding is this fun extra activity, where coding is an addition. Rather, coding should be pushed for it's value; for what we know it does: encourage logic. Logic is a way of thought that is difficult to teach. However, coding can be implemented in any curriculum to help with this understanding. Logic is a skill everyone needs. So, I urge you - do join in on the coding momentum because coding is logic and logic is a way of thinking we all need to be skilled at. However, don't join in the coding movement simply because "everyone else is." This only separates coding from being an integral part of the classroom. We need to know and understand why it's necessary. 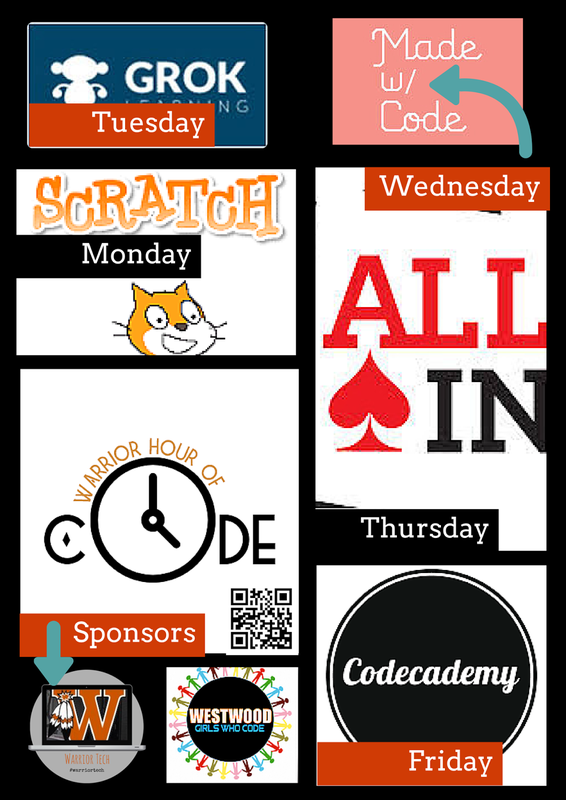 In honor of Hour of Code, the two clubs I sponsor at my high school, Girls Who Code and Warrior Tech, will be sponsoring a week of activities including an introductory session and a mentoring session. Rather than simply engaging in the games - because everyone is doing it - these activities (all still part of the Hour of Code) have purpose behind them - teaching logic and mentorship. Our students will assist other students in completing the activities to shed light on their clubs as well as our Computer Science classes. Our students will also assist students at an area elementary school in completing the hour of code. By doing this, students see a purpose and a connection. Your challenge: when completing the Hour of Code, give it purpose and continuance. Don't let it just be an "hour," but, rather, use the Hour of Code to bring it into the classroom full-time. Curious what we're doing? See our activities below and read about them here. Earlier this week, several chapters of GEG Texas led a pilot of Google's Lesson Plan Jam with 30 educators in Google's Austin offices. In the planning process, we weren't entirely for sure of the outcome, but that's the beauty in it. It's great to not have a known outcome and to let learning guide the day. At the end of it, I was surrounded by 30 educators determined to make a difference for their students for 8 hours. And, what more could a girl ask for? Other than, perhaps, Chrome cookies! The day was full of pods of innovation, connected in the context of one room. And a team of MCs with a passion for creativity and learning. Wait! And, more Chrome cookies. The day started off with discussing current frustrations in the classroom via sticky notes. Problems ranged from frustrations on document naming conventions to a lack of admin involvement in PD. And, after a brief tour of the Google Austin offices, educators were sent back to develop unit plans - either as a group - or individually met to innovate or target those problems. 3-4 educators were paired with a subject-area lead learner who helped pair the technological leader with the content expert. The pairing led to a room of inspired educators. With great collaboration not just on technology, but in person and on drawing boards. Sometimes, there is no substitute. Like teachers presenting to teachers their ideas through Demo Slams and project share-outs. Or teachers just having fun, having the time to plan and collaborate. Guest appearances by Google for Education. And a late afternoon share-out of the day's learning. Educators have a week to complete the lessons/unit plans started at the Jam. Once completed, lessons and unit plans will go up on our GEG Lesson Plan Jam site for others to search and adapt. The goal is to share learning and ideas. And, though many educators chose to integrate GAFE into their plans, the end goal was meant to be on the students - sharing, collaborating, and innovating the existing educational wheel. Check out our event's Google Site for more details on the lessons submitted. In the meantime - how can you get involved? Join your area GEG and what not join GEG CENTX while you're at it?! Stay tuned for more events - both virtual and face-to-face - in the coming weeks. Who are the digital natives? Recently, I was having a discussion about online textbooks. Who are digital natives? Well, it's not the students. The term "digital natives" has become part of common speech - so much so that the meaning has been lost. According to Google's definition, it's "a person born or brought up during the age of digital technology and therefore familiar with computers and the Internet from an early age." In talking with teachers about online textbooks, the point was raised that many districts go online because "students are digital natives" and "students are doing everything online." And, though, I'm a proponent of most things online, I have to disagree with this assumption. Even with my Warrior Tech students - students who run Linux on their HP Chromebooks - I would disagree that they are digital natives. Rather - I would say that they are digital users. They are not native to this environment. Native implies they are from a place. However, students are not from the digital age. WE ARE. We are the ones who witnessed the evolution of digital tools. We are the ones who created those tools. And, we are the ones who have the foundation in it. Students have been transplanted into this digital age. Additionally, digital native implies that students must also be familiar with computers and the Internet. However, as students born in a digital climate, they are immediately exposed to the current digital world, with little foundation in the previous digital worlds. This is where the disconnect occurs. We make the assumption that our students know the digital history that we know, but they were not around to witness that. And, as a result, we have students coding and running systems, with little background as to why its necessary or what power it has. We cannot make the assumption that students are digital natives until we also have proven that they are familiar with computers and the Internet. As a whole, we assume that since the first half of the digital native definition is true, the other half must be true of students. However, that is a great fallacy. Students are brought up in a world where there are textbooks on almost any concept. However, we cannot assume that, therefore, they are familiar with the concepts in those texts. Computers and the Internet familiarity are the same. We cannot assume students know and understand it. We can use what students do know to help them become fluent, but we must not assume they are digital natives. What do you think? Where do you expect students to be now? Are they matching up to those standards? Three months ago, my teachers took the plunge into Google Classroom and have not looked back since. There are now teachers who were not using Google Apps who now using it as a result of Google Classroom. I still have several teachers on the line on whether or not to use it and plenty not using it. Though I don't think all teachers need to use it, I think it fulfills several basic functions like digital dropboxes that can't be overlooked. It also allows teachers and students to be mobile and to be non-device specific. With new devices entering the classrooms and businesses frequently, it's crucial to be able to operate no matter the platform. So, I'm composed a list of frequently asked questions for why you should use Google Classroom and how you can make the migration simple. These ideas are not new. However, I've kept them concise so as not to overwhelm teachers. Lastly, I've found that creating a Google Classroom for staff is a miracle in the making. One drawback for my teachers was that they did not know what it looked like from a student's perspective. 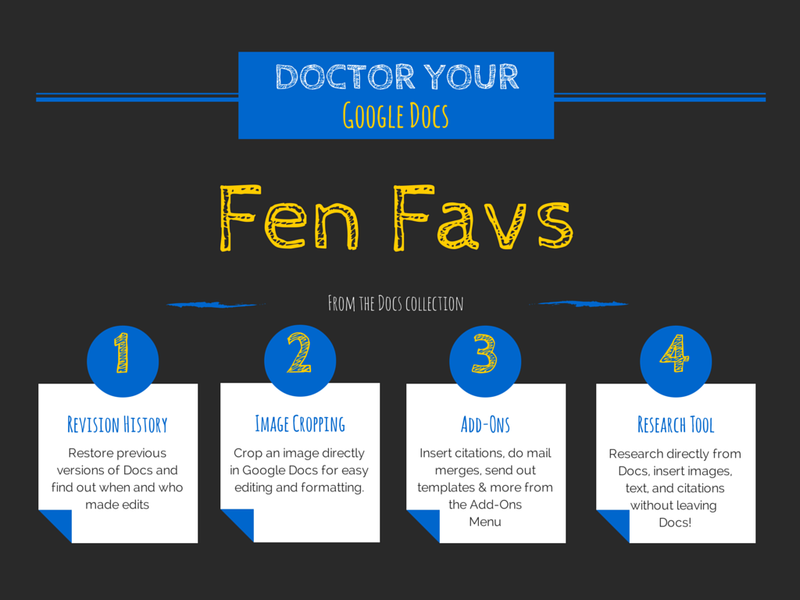 So, why not create a faculty Google Classroom? Have teachers join as teachers (important) and then, post assignments for them. Allow them to add comments and turn in work. This is a huge eye-opener for staff! View the complete Google Classroom Tips & Tricks below and here. Choose to either turn this feature off or educate users on this feature. easily printed for administrative action. cannot post. They can only view the teacher’s posts. desktop - perfect for when the Internet goes out. waves. No more worries about how to share documents and folders; Classroom does it all for you. Assign ANY type of file for your students (even Photoshop) and allow them to upload it to classroom. Access it online or on your desktop (for those who downloaded Google Drive for Desktop). section, students no longer have to scroll for information. Google Drive. This is the advantage to Google Classroom - you don’t have to manage those Google Drive folders and sharing anymore. So, let Google Classroom take care of it for you. Think of of this as just a storage space. The real work happens in Google Classroom.